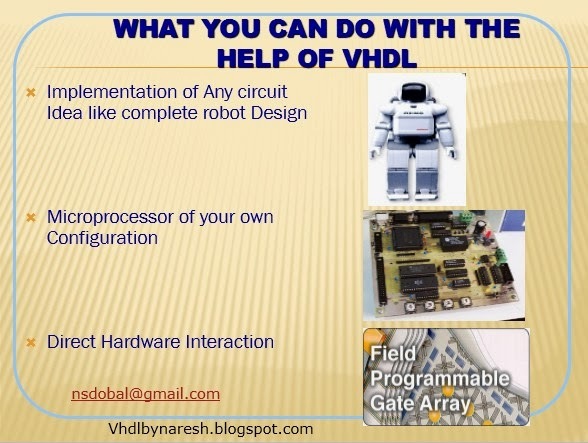 What a Designer can do using VHDL : (Learn VHDL with Naresh Singh Dobal series). So here, I should say that you can design a complete digital system and electronics system using HDL’s, You can design any type of circuits like a complete robot system, a home automation system, security system, life style appliances, Industry automation system, PLC’s etc, even you can design a microprocessor or a micro-controller of your own configuration according to your requirement, you can design a computer on chip etc. Second most widely used application of HDL’s are in Application domain, Here you can directly configure your design or system on Hardware with the help of PLD’s, There are multiple type and class of PLD’s like PAL (Programmable Array Logic), PLA (Programmable Logical Array). SPLD (Simple Programmable Logical Devices), CPLD (Complex Programmable Logical Devices), PROM (Programmable ROM), FPGA (Field Programmable Gate Array), ASIC ( Application Specific Integrated Circuit). Among these FPGA & ASIC are widely used for configuration. That means with the help of FPGA devices we can directly configure our system on Hardware and can test our design in real time environment. We will discuss more thing about PLD's Later in our series. Kindly share your comments, ideas, questions or suggestions to make this series interactive and more informative.